This year’s census was held on 15-17 January 2016. A total of 3,356 birds were recorded in 2016 census, having 84 birds more than the 3,272 birds recorded in 2015, which is an increase of 2.6%. 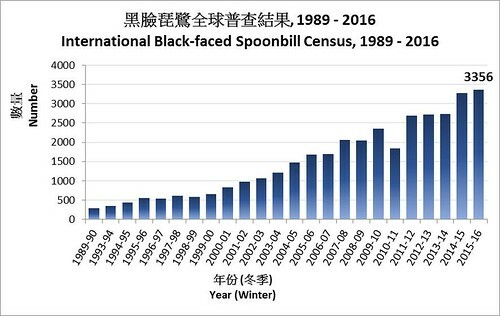 The largest wintering population was found in Taiwan with a figure of 2,060 individuals, accounting 61% of the world population, which was 26 individuals (equivalent to 1.3%) more than the 2,034 individuals recorded in 2015. The numbers recorded in South Korea, Japan, Taiwan, mainland China and Macau increased, while those in Deep Bay (Shenzhen and Hong Kong) and Vietnam decreased. Deep Bay, including Hong Kong and Shenzhen, recorded 371 individuals, accounting 11.1% of the world population. It was 40 birds less than last year (411 individuals in 2015), representing a decrease of 9.7%. There was a sharp decrease in number of Black-faced Spoonbills in Vietnam during the census in January, from 40 individuals recorded in 2016 to 9 individuals in 2015. Human disturbances was suspected to be the major reason. Increase was also recorded in South Korea, Japan, mainland China and Macau. The number in mainland China increased by 104 individuals, which means an increase of 31.5%. A Black-faced Spoonbill was recorded in The Philippines during this winter, but unfortunately it was not found during the census. Locations included in this census include South Korea, Japan, Shanghai, Zhejiang, Fujian, Guangdong, Guangxi, Hainan, Jiangsu, Taiwan, Hong Kong & Shenzhen, Macau, Vietnam, the Philippines, Thailand and Cambodia. The Society would like to take this opportunity to thank all regional organizations and volunteers for their participation in the census, contributing to the smooth conduct of this census throughout all years and therefore better conservation of Black-faced Spoonbill in the region. To see more results below, please click here. To find out more about Black-faced Spoonbill, visit the EAAFP BFS Working Group page.